﻿Greetings! 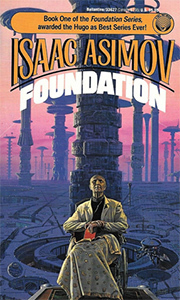 Welcome to A Set of Vague Axioms, the fanlistings.org-approved fanlisting dedicated to Foundation series, a science fiction book series written by American author Isaac Asimov. This is one of my favorite series and I've probably read it 10 times. The Foundation Trilogy was originally a series of eight short stories published in Astounding Magazine in 1942-1950. The first four stories were then collected, along with a new story taking place before the others, as a fixup published by Gnome Press in 1951. The remainder of the stories were published in pairs by Gnome as Foundation and Empire (1952) and Second Foundation (1953). The political intrigue, religious undertones, innovative sci-fi thoeories, world building, and epic scope make Foundation one the greatest sci-fi series ever created. The premise of the series is that the mathematician Hari Seldon spent his life developing a branch of mathematics known as psychohistory. Using the laws of mass action, it can predict the future on a large scale. Seldon foresees the imminent fall of the Galactic Empire, which encompasses the entire Milky Way, and a dark age lasting 30,000 years before a second great empire arises. To ensure the more favorable outcome and reduce human misery during the intervening period, Seldon creates a group of scientists called the Foundation to preserve and expand on humanity's collective knowledge, and thus become the foundation for the accelerated resurgence of this new galactic empire. Know nothing about fanlistings? A fanlisting is simply an online list of fans of a subject, such as a TV show, actor, or musician, that is created by an individual and open for fans from around the world to join. They are a way to show your love or support. The only requirements to join a fanlisting are your name and country. To link back to a fanlisting you've joined, you can use small images called codes or buttons. Codes/buttons are placed on your own personal website and are linked back to the fanlisting so that other people may see the code and know that you are a fan. To learn more about fanlistings, please visit thefanlistings.org. The fanlisting exists for nonprofit entertainment purposes only. Everything belongs to its respective owners, no copyright infringement intended. A Set of Vague Axioms is a part of sleety.org and thefanlistings.org, layout version 1.0. The website was done by me (deerstop) in Adobe Photoshop CS5 and coded in Notepad2. Fonts used: Bauhaus and MetaPro. If you wish to contact me, please use this form. Fight Spam!